This story on making and eating old-fashioned apple cake and Magic Bars ran on Patch yesterday morning. Due to budget cuts, Patch has stopped using freelancers so this is my last Sunday Night Supper column for them. But as always, if you have recipes or comments to share, please go to the Patch site. Your comments could help land a new home for this column. Thank you, as always, and happy Valentine's Day. Sunday Night Supper: Apple Cake and Magic Bars. Hello, loves. Since this will be my last Sunday Night Supper column, I thought I’d go out with a bang. I love to cook, but I love to bake even more, and what I love the most is when someone shares a recipe that she (or he) really loves and this new dish turns out to be shockingly spectacular. This happened New Year’s weekend. Every year since Y2K, we've been going to my brother's house in Montclair for New Year's. It's always a heady crowd, literally and figuratively. My sister-in-law Nancy is a psychologist. She has two sisters. One is a high-powered TV executive who is married to a psychoanalyst. Another sister, a law professor, used to be married to a psychiatrist and is now married to a physics professor. My sister-in-law's mother writes for The New York Times; her father is a retired judge. You can see where this is going. They’re all really smart. Worse, they all know food – know it and love it. My brother likes to make turducken – that’s a turkey with a duck and a chicken cooked inside it. His brother-in-law, the psychoanalyst, makes extraordinary combinations of roasted vegetables when he's not grilling outside in winter. My sister-in-law's sister, the law professor, is close with Rosie O'Donnell's brother Daniel, and he’s taught her how to make a fabulous salad with a wonderful dressing. The dressing has honey in it, and the salad always has sunflower seeds and cranberries...you get the picture. Rosie O’Donnell’s brother's salad rocks. The bottom line is I go to this New Year's Eve party every year, and I’m often the dumbest person in the room and not even the best cook. Last year, I brought Key Lime Pie. That was a disaster, not because it tasted bad (it didn't) but because it was ugly. All the other desserts were beautiful. This year, I planned to bring dessert again, but my sister-in-law warned there would be other desserts as well – a spectacular sorbet situation, known as the Bomb, and a dramatic chocolate fountain in honor of the birthday of a niece. My sister-in-law (remember, she’s a psychologist), gently said that given the competition, maybe I should just bring appetizers. Fine, I would pick up some appetizers at the Wine Library but I was intent on making dessert too. I had already bought the condensed milk for Magic Bars (also known as Outrageous Cookie Bars) and damn if I wasn't going to use it. The thing about Magic Bars is they are a crowd pleaser. People don't realize how much they miss sweetened condensed milk until they bite into it. Then they can't stop eating it. But Magic Bars are easy. Magic Bars are nothing new. They take almost no effort to assemble and everyone knows it. With just five ingredients (six, if you add nuts), your five-year old could make them as long as you help with the oven. I felt a little sheepish bringing Magic Bars to this party of foodies. But they were my favorite thing to make (and eat) and I wanted to start the New Year off by sharing them. I also wanted to make something that showed real effort. Okay, I wanted to show off. I had a new recipe for apple cake sitting in our recipe holder. A friend of a friend had emailed it – she had gotten it from her Grandma Becky. This woman, Jodi, had given me a recipe for a cream cheese chocolate chip pound cake, which was beyond delicious (see Sunday Night Supper.) 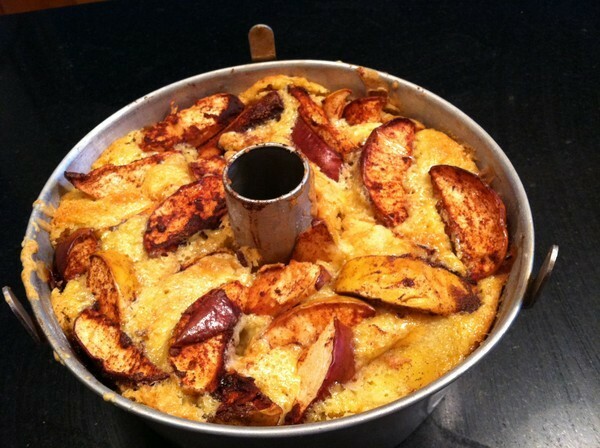 Then she emailed a recipe for her late grandmother's apple cake. “It's heavy," she warned. "And it's great." Heavy and great sounded perfect. Plus, we had all the ingredients. Or so I thought. I mindlessly didn’t check the pantry before I started to cook. The recipe called for vegetable oil instead of butter. I knew we had a big bottle of vegetable oil in the pantry. Oh, look there it is. It's empty! But we had corn oil. Corn was a vegetable, right? I smelled the corn oil. It smelled way too strong to be mixed up with a bunch of apples and flour. I called my neighbor, who sent her 11-year-old over with a cup of vegetable oil. Well, not quite a cup. I had to top it off with a little corn oil. Then I went to work. The batter was thick, heavy and yummy. (I shouldn’t be admitting to scarfing down raw batter but this is my last column, so I'm putting it all on the table.) The recipe had instructions that said, "Grease tube pan and dust." Dust with what? I wondered. Duh, dust with flour. The cake had apples on top. When I took it out of the oven, it wasn't pretty. I flipped it over and it fell apart. I put it right side up. The cake was ugly. That was the only way to describe it. I showed it to my mother, who agreed it was ugly, but said it would probably still taste good. We brought it to the New Year's party and someone brought it to the table. People stared at it. "That is ugly," someone said. Then they pounced on it. There was no serving piece. People grabbed pieces of it with their hands. "I think that's the best dessert I've ever had," my brother said. "Wow," my friend Jessica said. "People love the cake," my husband said reassuringly as he took another piece. I made this cake again to bring to my brother and sister-in-law’s Super Bowl party last Sunday. The crowd was almost identical to the New Year’s crowd. The cake was just as ugly as it had been before. The reaction was the same. The cake was gone in minutes. I don't know why this cake is so good. Maybe it's the combination of vegetable oil and orange juice. Maybe it's the four eggs. Or maybe it's Grandma Becky, who knew what she was doing when she baked but probably had no idea that several decades after she first started baking this cake, people would still be pulling it apart and gobbling it up. Valentine's Day is in two days. Either, or both, of these desserts could make the object of your affection love you that much more. Thank you for reading and cooking along with me these past five months. It’s been a pleasure. Grease and dust tube pan. Place one layer of batter and one of apples in the middle. Another layer of batter and top with remaining apples. Bake at 350 for approx. 1 1/2 hours until top looks done and toothpick comes out clean. If you've enjoyed reading Laura's Sunday Night Supper column would like to read more of her work, check out her blog, Flawed Mom. This column is ending, but these Magic Bars and apple cake will see you through the winter.